You probably know the basics. Machines on the internet have an address which looks like 123.45.67.89 – those four numbers represent four bytes, and while four bytes provide rather a large number of addresses, it turns out that this internet thing is rather popular, and four bytes isn’t nearly enough. These addresses have been in short supply for some time, and so, while your broadband router will have one, the laptops, XBoxes, smartphones, etc on your local network can’t all get an address of their own. Your heating controller, your TV, your electricity meter will soon all want to be connected too. No way, Jose. Instead, most networked devices use addresses that are only valid on your local network – a reserved group beginning 192.168… Think of 192.168 addresses as internal phone extensions, rather than proper phone numbers. Whenever your devices want to communicate with the outside world, they do so via a special bit of software on your router called ‘NAT’ – the ‘Network Address Translation’ system – that temporarily connects 192.168 internal addresses to real addresses in the outside world. 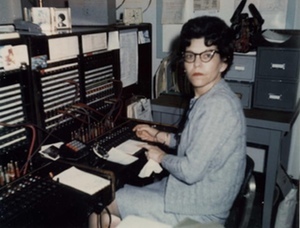 It’s a bit like a telephone switchboard operator – let’s call her Mavis – who can connect internal phone extensions to a limited number of external lines. In fact, we can push the switchboard analogy a bit further because, in general, the machines on your network can contact the outside world automatically by the equivalent of dialling ‘9’ to get an outside line. The outside world, however, can’t contact you without going through Mavis, and she’s very picky about who she’ll let through. There are no direct-dial numbers. This has some real benefits: it can keep pesky salesmen at bay. But it also makes it really hard for your spouse/lover/next-employer to get in touch with you for more delightful discussions. Mavis gets rather too involved in those… And remember, we’re not just talking about the office, here. Mavis is also in your sitting room at home. The interesting thing is that we’ve been in this situation for so long that we accept it as normal. Most of us have had NAT for as long as we’ve had broadband connections, and it has fundamentally affected the way we think about the internet and what it can do for us. We’ll come back to that in a minute. Despite all of the above, we might have gone on employing Mavis for quite a while, if it weren’t for a much bigger problem looming on the horizon: we’re running out of addresses even to give to the routers. Not much point in having an efficient switchboard operator if there are no outside lines! Your ISP has to manage the IP addresses it hands out carefully and make sure there aren’t too many unused ones lying around. If your internet connection uses DSL, for example, you may find that your router’s IP address – the phone number of your outside line – changes fairly regularly as a result, so there’s little chance of your spouse/lover/next-employer being able to talk to Mavis even if they wanted to! This is the basic problem that IPv6 is designed to fix. In the future, internet addresses will be made up not of 4 bytes, but of 16, which gives a wonderfully huge number of addresses, and every connected device in the world can have one (or indeed, several, which often proves useful). IPv6 has some other useful features too, but this is the most important. A quick aside – what do these new addresses look like? IPv6 addresses are the equivalent of 39-digit phone numbers, so they’re less convenient if you actually have to type them in! To make them a bit more manageable, they are written as eight groups of 4 hexadecimal digits, which makes them look a bit strange and scary to anyone who’s just getting used to addresses like 192.168.0.1.
which resolves to the same thing: the DNS can hand out IPv6 addresses in just the same way as the old IPv4 ones. One last thing before we get back to the big-picture stuff: there are some address groups set aside for specific uses. Addresses beginning fe80::, for example, are the equivalent of 192.168 addresses – they are just designed to work on the local network. A device will have at least one of these automatically, as well as any global addresses it may have been allocated. In fact, if you have a reasonably recent operating system, you’ve probably got one already on the machine you’re using now, though you may need to burrow a bit into your network configuration to find it. (On a Mac or Linux box, run ‘ifconfig‘ on the command line. On Windows, you need to enable IPv6 first and then use ‘ipconfig‘). So you can already use utilities like ‘ssh’ and ‘ping6’ to talk to other machines on your network using these addresses, even if not to the outside world. Backing up your computer to a hard drive on your sister’s machine, and allowing her to do the same to yours. Plugging in a networked webcam and accessing it from anywhere. Printing something on your office printer when you’re at home, or on your home printer when you’re at Starbucks. Logging in to your parents’ machine to help sort out a problem. Accessing that presentation you left on your machine at home from the conference centre where you’re supposed to be giving a talk in the morning. Making VoIP (internet-based telephone systems) work reliably. Running your own web server on a computer at home. Turning on your heating from the airport as you come home from holiday. All of these things can of course be done at present, but they usually involve special expertise, or services like Dropbox, GoToMeeting, DynDNS or Skype, which have grown up largely to deal with the fact that, in general, you can’t just connect to other machines on the internet because they don’t have a globally-accessible address. Sometimes it’s a case of going and having a polite but firm word with Mavis to say that she really must allow certain calls through. In other cases, it’s much more complex. The electricity company could easily put a smart meter in your house, for example, so they don’t have to bother you so often, but they’d have to speak to every Mavis in the country. A daunting task, I think you’ll agree. And then there are other systems like uPnP that are used by games consoles, for example, to sneak behind Mavis’s back and do a little wiring of their own just to make it easy to play games with your friends. All rather messy. This is why you want to encourage your ISP to support IPv6 as soon as they can. They’ve known about it for a long time, and it’s been rigorously tested. In a future post, I’ll write about how you can bypass both Mavis and your ISP if you want to start using this now. But at least, I hope, you understand why it is more important than simply a change of phone number. Thanks for this, Quentin. Seems like the media attention on IPv6 rests solely on the IPv4 shortage but like your fine post here I, too, to see it as a great opportunity for “real” platform-agnostic P2P applications to come out about. Things like VoIP, video conferencing–basically anything real-time and peer-to-peer stands to improve loads, I think. We’re all eager to hear more Mavis talk. In the meantime here’s a related post from Philipp Klaus’ interesting and helpful blog (he’s got a Raspberry Pi and likes OpenWRT).